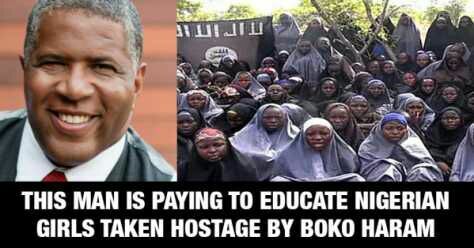 Government Girls Secondary School were taken hostage by Boko Haram terrorists. While there was an initial world-wide positive reaction to get the girls back with the#BringBackOurGirls campaign the world at large has moved on and many of these poor girls are forgotten, still in the clutches of the terrorists. These poor girls were taken just for turning up at school and wanting to learn. Of these 300 girls only around 50 have managed to return and according to the Atlanta Black Star the impetus started to get them back appears to have slowed down. Extremely sad. However one very high profile figure has not forgotten about these girls and has put forward his help in an incredibly positive way. According to Forbes billionaire Robert F. Smith is said to be the second-richest African-American in the world. He is personally helping many of these girls by paying for their education with pledges to pay for more released girls. Smith founded (he is also chairman and chief executive) Vista Equity Partners. They have set up a fund to pay for 21 girls who escaped Boko Haram and have been brave ebough to enroll in scholarships. They have enrolled at the American University of Nigeria. “He said, ‘I’ll cover their expenses for as long as they needed it,’” Ensign said of Smith’s offer to pay school fees and expenses of all 21 girls. “And then – it was just incredible – he basically said, see if you can find the rest of the escaped girls, and we’ll help them too,” he added. “We’ve got the Black Lives Matter campaign going on in the U.S. at the moment, and thesegirls matter too,” Smith said.